Here's what to keep an eye on when the software specialist releases its earnings. BlackBerry's (NYSE:BB) transformation from a smartphone company into one selling enterprise software and security hasn't been very smooth. The company's slow transition has not excited investors as its top-line growth has failed to take off, primarily because it is still somewhat dependent on its legacy businesses. However, there can be no denying that BlackBerry is turning its business around, albeit slowly. It's made a name for itself in the automotive space and is going after the lucrative enterprise security market to secure long-term growth. Consistent growth on these two fronts should ensure that BlackBerry's second act is a successful one. That's why the company's upcoming fiscal third-quarter results are so important, as they'll put its transition efforts into the spotlight. Let's see what's expected of BlackBerry when it releases its results on Dec. 20. BlackBerry's third-quarter revenue is expected to drop nearly 9% year over year to $214.4 million. That's because the company was dependent on the device and service-access businesses for 8% of its top line (or $17 million) in the second quarter, with the remaining coming from software and services. As BlackBerry winds down these legacy businesses, its top-line performance has fallen despite growth in its software and services businesses. For instance, the company's software and services revenue had increased 1% in the second quarter of the year. But a 67% annual drop in the legacy businesses meant that its overall revenue declined 14%. The good news is that BlackBerry's revenue decline is expected to slow down in the current quarter, and it shouldn't be long before the company starts delivering growth once again. BlackBerry expects 8% to 10% annual growth in the software and services business this fiscal year. By comparison, the company's software and services revenue had increased 14% in fiscal 2018 to $782 million, while legacy businesses supplied $185 million in revenue at that time. The company has generated just $41 million in revenue from the legacy businesses during the first six months of the year, so its financial performance will soon be solely dictated by the software and services business. Now, Wall Street expects BlackBerry to deliver $893 million in revenue this fiscal year. This means that analysts aren't expecting any further contribution from the old business, as the company's software and services revenue should come in at $852 million at the midpoint of its guidance range. As a result, the company needs to ensure that its software business gains more traction to win back investor confidence. The bad news is that BlackBerry has been lacking on this front of late. 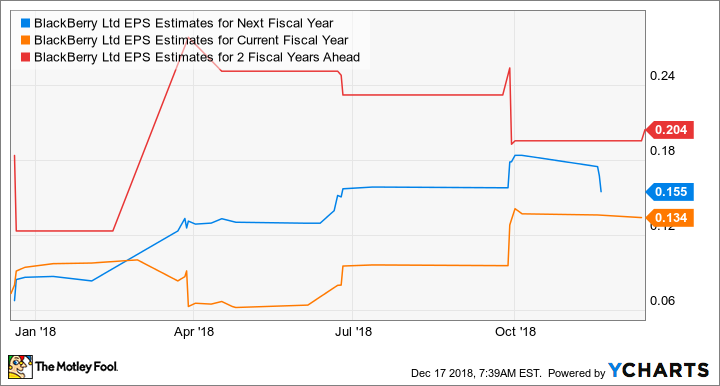 We've already seen that the company's software and services revenue growth is expected to slow down in the current fiscal year, and it isn't expected to pick up a lot of pace. In fact, BlackBerry's overall revenue is expected to increase just 4% in fiscal 2020, which begins in March next year. That doesn't look good for a company that's trading at a rich forward price-to-earnings (P/E) multiple like Blackberry. However, investors should also note that the slow growth of BlackBerry's top line is also because of the ASC 606 accounting change. The company is now accounting the revenue from perpetual licenses over a four-year period, as compared to the earlier practice of immediately recognizing the inflow on the income statement. The company reportedly gets 20% to 30% of its top line from perpetual licenses, so the accounting change is definitely impacting the company's short-term growth, at least on paper. However, the company's enterprise business, which produces 42% of the total revenue and is a key cog of the software and services portfolio, is enjoying solid momentum. It recorded double-digit sequential growth in the second quarter. In addition, BlackBerry has taken a bold step to boost its software presence. The company recently shelled out $1.4 billion to buy cybersecurity company Cylance, which provides a variety of security solutions to more than 100 Fortune 500 clients and 3,500 enterprise clients. This move seems to have opened up a big opportunity for BlackBerry to cross-sell its products between the old clients and the newly acquired ones, because of the complementary nature of the two businesses. The combined company will now become a one-stop shop for enterprises looking to secure their end points. More importantly, BlackBerry believes that Cylance opens up an $11 billion opportunity in the fast-growing cybersecurity end-point space. It wouldn't be surprising to see an improvement in BlackBerry's earnings power in the future that should justify its rich valuation. BB EPS Estimates for Next Fiscal Year data by YCharts. BlackBerry could eventually turn a profit thanks to its software-focused endeavors. Investors should be paying closer attention to what management has to say about the future of the software business, as that will be crucial to its turnaround in the coming year and beyond.